I have a laptop Asus A43S (Some said A43SJ) with Intel Core i3 processor. From this link, it seems this laptop has a bluetooth device integrated. 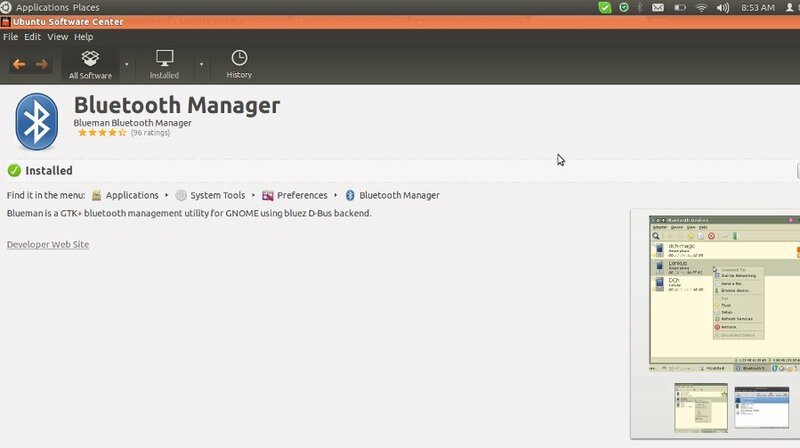 I tried to install a software bluetooth manager, blueman, for Ubuntu 12.04 from Ubuntu Software Center App. The app reside on System Tools -> Preferences -> Bluetooth Manager. After running it, I got the greyed bluetooth icon on top bar panel. I tried to turn it on but it can’t. It seemed freeze and I had to kill the app (blueman-applet). I browsed the problem on internet and hope to get a solution. From my terminal, I got some hardware setting. 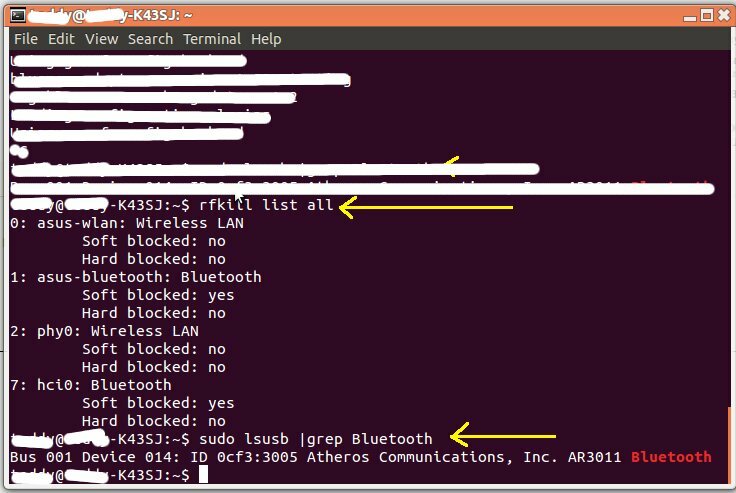 rfkill and lsusb | grep Bluetooth commands showed my hardware setting related to the bluetooth device. It showed I have Atheros bluetooth. It also said my bluetooth hardware (ID 7: hci0) didn’t blocked (Hard blocked : no) but blocked by software (Soft blocked : yes). hciconfig command showed the detail setting. It seemed my bluetooth hardware is DOWN. I tried to make it up by typing sudo hciconfig hci0 up but it didnt work. After many trying, it can be solved by following this tip. I just type sudo hciconfig hci0 reset and hciconfig again to see the result. My bluetooth is up and ready now. NOTE: sometimes the bluetooth can’t be turned on or it take a long time to be on. I found the problem when I hibernated and resumed my Ubuntu. If I kill the app (bluetooth-applet) and open it again, it didn’t work. I have to run the reset again (sudo hciconfig hci0 reset). It is really annoying but it work. 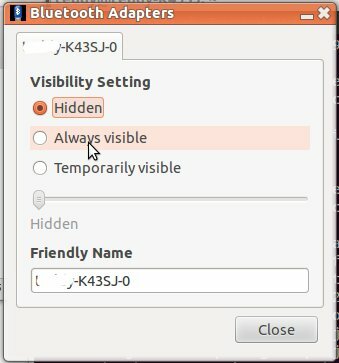 Before pairing, I need to set my bluetooth adapter visible so it can bed displayed from my smartphone. Please pick Always Visible or Temporary Visible. Now I can pair my laptop with my smartphone and exchange the photos and mp3. 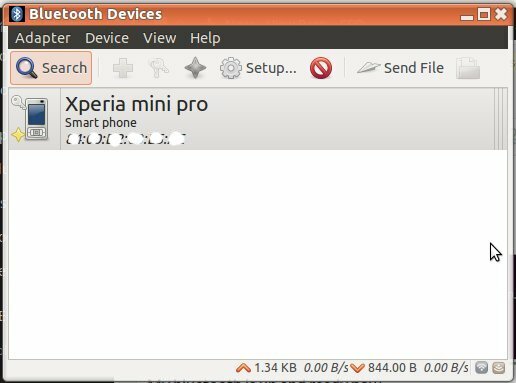 When I used this application to exchange data for the first time, I found a difficulty where the files from my smartphone put in my Ubuntu harddisk. This Bluetooth Manager doesnt have a setting for a directory where to place the files for from another device. At last I found the files are put in /Public directory.